A classic favorite, tacos are tops with both mom and kids. 1. PREHEAT oven to 300°F. Crumble meat with wooden spoon in large skillet. Brown meat; drain. 3. TEAR lettuce into small bite-sized pieces; place in serving bowl. 4. SPOON cheese, salsa and sour cream each into separate serving bowls. 5. PLACE taco shells on baking sheet. Bake 3 to 5 min. or until crisp. 6. 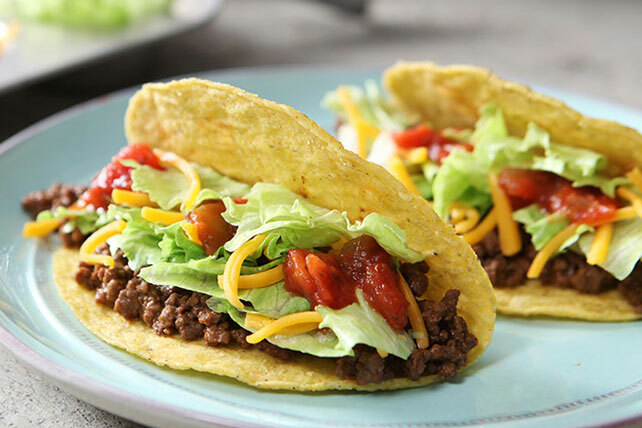 SERVE taco shells with seasoned meat, lettuce, cheese, salsa and sour cream. Let everyone build their own tacos. Makes 6 servings, 2 tacos each.